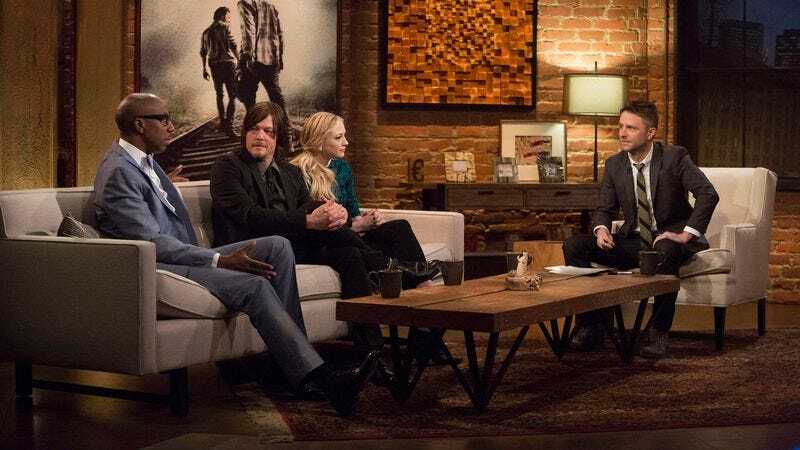 When AMC launched Talking Dead in 2011, viewers didn’t have a hard time getting on board with its punny title and its blatant attempt to squeeze an extra few advertising dollars out of The Walking Dead. Then AMC launched Talking Bad in 2013, which didn’t make as much sense pun-wise, but it was still a welcome venue for watching famous people talk about Breaking Bad’s final half-season. After Talking Bad, AMC introduced Talking Saul, a Better Call Saul aftershow with a name that was even further removed from the original Walking Dead-based pun. Now, though, AMC has made this whole thing worse with the announcement of a Preacher aftershow hosted by Chris Hardwick that will air after the comic book adaptation’s first and last episodes. Anyone in their right mind would know that this show should be called Preaching Preacher, The Preacher Preach, or simply Preach!, but that’s not what AMC is going with. Instead, the show is going to be Talking Preacher, just like the other ones. Apparently, despite all of the accolades AMC has managed to collect over the last decade or so, it’s still tragically committed to settling for Talking Whatever instead of introducing new puns for the world to enjoy. Preacher will premiere on AMC on May 22, and the special installment of (sigh) Talking Preacher will premiere after a rebroadcast of the Preacher pilot on May 29. The second Talking Preacher installment will air after the show’s season finale, which is set for July 31.